I am contacted you from Birkemhead playcentre where many budding robot makers exist! We are a pre school facility (0 - 6 years old) and we are looking to find someone to come into our centre and show the children how to make a robot that is at their level...that is something that they could do themselves...not necessarily a real one. I appreciate that this is not necessarily something you proberly do but could you forward this to someone who could help us? Many thanks. thanks for your repsonce, sorry I thought I was on the nz massey university website, not london!! My "istethoscope" application (which allows you to listen to your heartbeat and features a little undercover scientist giving little facts now and again) has now been on iTunes for just under three days. To my surprise it's had over 7000 downloads already and is in the top 30 Utilities in the store. 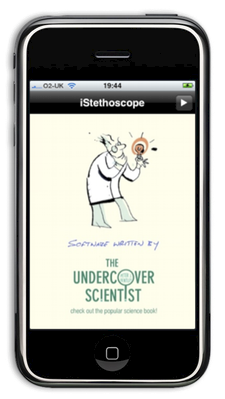 I'm hoping it will help people become aware of The Undercover Scientist book, so it's very exciting that the app is popular so far. If any reader of the book or user of the program has any ideas for other free "undercover scientist" programs for the iphone, or something for the "Why Sh*t Happens" US version, let me know! I may be a collaborating professor at KAIST, but my Korean is limited to saying hello and thanks and ordering food. 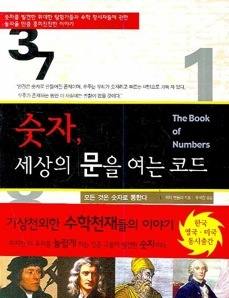 According to Babel Fish the title should be 수의 책 which is not quite what it says on the cover, see for yourself below. So I'm wondering what the title of my own book is... Anyway, it's always fascinating to see just how complicated they make cover designs out there compared to Western designs - it's a cultural difference that you see in many product designs (I think the red strip in the picture is just a loose "sales ribbon" to help sell the book). I prefer the UK, US and German covers, whatever this one says. 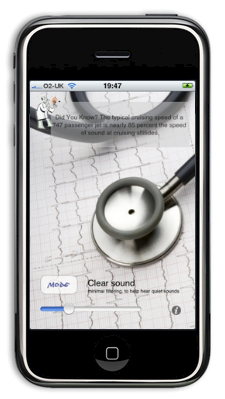 For fun I recently created an application for the iPhone - iStethoscope which basically turns the device into a stethoscope, allowing you to listen to your own heartbeat (or other quiet sounds nearby). I've linked it to The Undercover Scientist book, using the little scientist cartoon as a friendly way to show (hopefully interesting) facts related to sound and hearts. For those interested, here's a little detail about how it works. The program takes audio from the microphone, buffers it for a very short amount of time and then plays it. Playing is continuous as new audio is received, so all processing has to be performed on-the-fly as the data is copied from input to output buffers. Inevitably a small delay results from this buffering process. Several types of processing happens - a low-pass filter is applied to remove hiss, a high-pass filter is applied to remove rumble, a heartrate monitor listens and attempts to count repetitive noises separated by quiet, and an automatic volume control listens for excessively loud sounds. If a loud noise is detected, the filter parameters are adjusted to reduce the volume. These adjustments are then slowly returned to normal when only quieter sounds are detected. The different modes correspond to different filter settings and different gain settings for the volume control. "Heartbeat" uses a heavy low-pass filter to let low thuds through but remove most higher- pitched sounds and reduce crackle of microphone against skin. "Conversation" uses low and high pass filters to let through middle frequencies like those transmitted by telephones. "Clear Sound" uses minimal filtering to let most of the sound through unchanged. The heartrate monitor is active in "Mute" and "Heartbeat" modes. Because it cannot use extreme filtering to make it work better (that would make it sound awful when listening) it does get a little confused if there is any crackle or noise. It only displays the pulserate when it is reasonably sure it's right, so you have to position the microphone carefully to make it work. Simultaneously to all this on-line processing, the controls are monitored and now and again the little undercover scientist is animated in a separate concurrent thread. It's all optimized to work with as little delay as the processor can handle. But if a different program or operating system process decides to use the processor or audio, this can screw up the audio buffering and cause minor audio glitches. (If that happens the program should be restarted to reset the buffering.) The best way to improve speed and avoid problems like this would be to do all processing in the iPhone audio Digital Signal Processor instead of in software; unfortunately the API does not permit this. 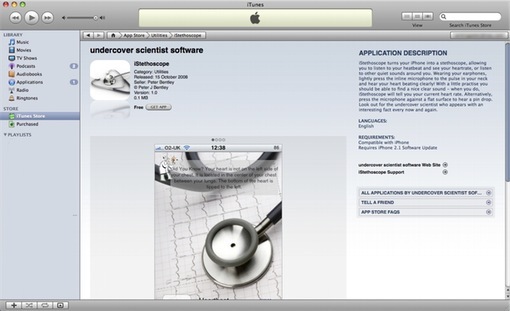 The application is now freely available on iTunes, just search for "istethoscope" in the AppStore. Please leave feedback if you download it! For details about version 1.1 click here. For details about version 2.0 click here.